Arlington Industries is offering a new series of floor box kits, covers and accessories aimed at making floor box installation easier and faster for contractors. Among the new features are kit pieces interchangeable with a variety of other manufacturers’ floor boxes. The company’s kit for new concrete pours, for instance, includes a heavy-duty plastic FL BC 40502 floor box with six conduit hubs and four plugs, more than it and most other manufacturers previously offered. A new leveling ring on the 4.5-inch non-metallic concrete box makes it a “universal fit” for any of the company’s six-inch round covers as well as most other manufacturers covers on the market. A nice new feature is differentiated screw patterns on either side of the cover. Use Side A of the cover to accommodate any 3.5-inch screw hole patterns, or flip the lid to find a second set of holes on Side B for a 3 3/8-inch screw hole pattern. Covers for the new concrete pour kit are available with flip lids or threaded plugs, in brass or nickel-plated brass. 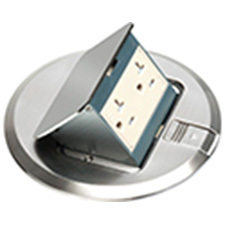 In addition to the new concrete pour kit, Arlington offers a wide range of other floor box kits, including trapdoor cover kits, recessed covers and single, double and even triple-gang floor box kits, as well as a combination box kit with an installed divider for power and low voltage in the same box. Rectangular and square metal covers with flip lids and plugs, as well as plastic covers in up to five different colors, are also available in various floor box kits from Arlington.